Hello again fellow scrummers. 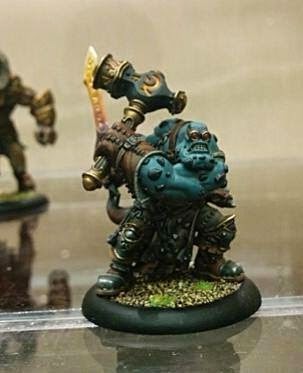 Today we're here to introduce, for those that haven't met him, are new friend Horgle Ironstrike. So let's get to the nitty gritty and just look at what the big guy can do. His stat line isn't bad he's decent SPD 5, so without buffs threats 8.5". He hits as accurately as a fennblade with MAT 6, and his RAT is negligible since he lacks a range weapon. Standard troll def and base 15 ARM, but a nice 17 when under the stone. He's also fearless, tough, and immune to fire attacks. He's got 8 wounds, like a good troll, and fury 4, so with ARM 17 he has some survivability (still better off then some of the Lesser Warcasters). He's got two weapons, both without reach, and are magical weapons. His POW 11 sword also causes continuous fire, his hammer is POW 12 with Critical Ram. Though with the Stone easily made POW 12 and 13. With his Pyre or Slag animus POW 14 and 15. Or have your caster bring a Mauler and he becomes POW 15 and 16. Add eMadrak and you have up to six MAT 6 weapon master attacks, one at POW 15, the other five at POW 16 and if the target isn't dead it is on fire. So even without beasts this guy can be considered a crazy combat solo for late game. Even with his crazy melee potential it's crazy not to take beasts with him. 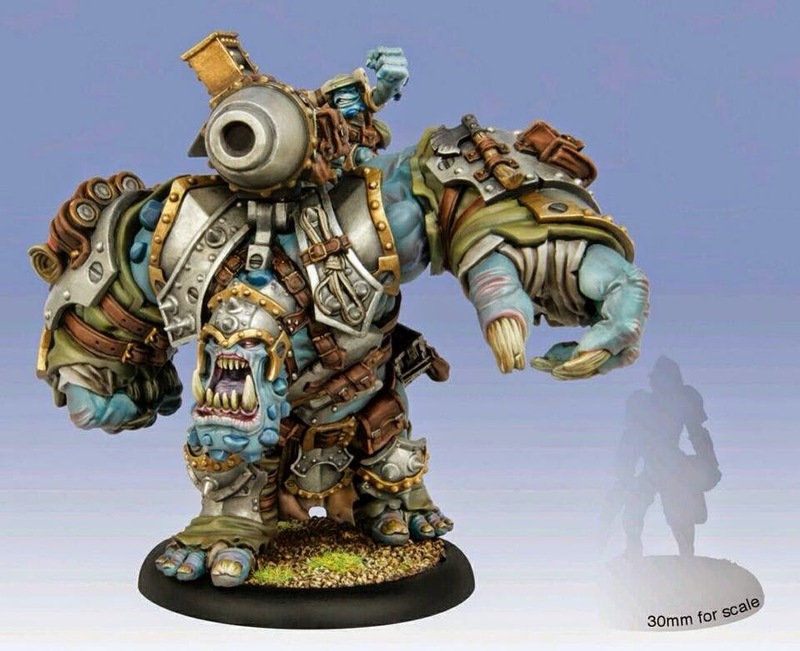 Mind you he is limited to Slag and Pyre trolls, though both come at a 1 pt discount if in his battle group. He also has the rule Burnt Meat which situationally allows beasts in his battle group to charge models for free that are suffering from continuous fire. So if he needs a little help in melee they can follow him in for free, or charge in after a Pyre troll sets it on fire with its gun. Speaking of guns Horgle has the 2 COST spell Hot Shot, which boosts the ranged damage rolls of one of his beasts in his battle group. This at first didn't strike me as great, but looking back now I realise that I was just being stupid. On a Pyre troll you now have focus to boost the attack roll and cast his animus on something else, because everything under that 3" AOE is going to suffer boosted POW 6. The Slag can now pay to boost its initial range attack roll, still pay for a second shot, and boost the attack roll, because the spell makes sure you get that fourth die on damage against non-living models. Initially I thought Horgle was going to receive a distance buff to ranged attack rolls, but I'm just as happy with boosted damage rolls. Horgle's second spell is Molten Metal, an offensive COST 2, RANGE 10 spell that puts one point of damage in every column of a Jack's damage grid. It is a little situational, as it is only effective against Warmachine factions, and while it has a little more threat then his charge, it isn't nearly as effective as actually just charging. I feel that Horgle will be a fine addition to our future endeavours in the Iron Kingdoms. 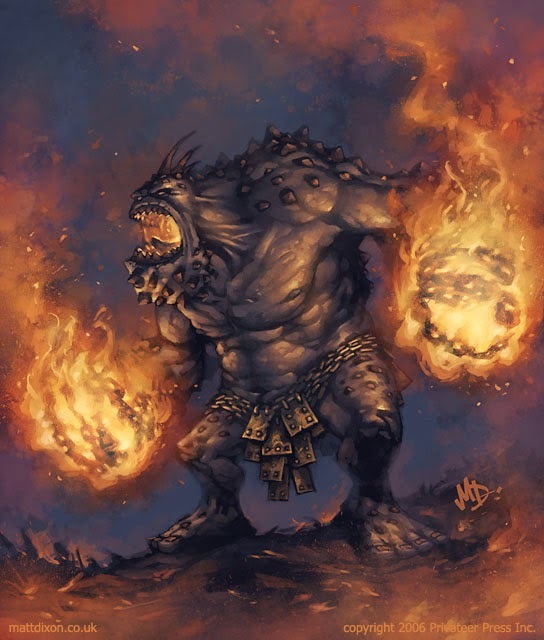 Many of our casters are focused starved and won't mind a 3 COST melee monster that can also sit back and throw out Slag and Pyre animuses, while they are busy casting other spells or fueling the Krielstone. I can't wait for June to get this guy on the table. 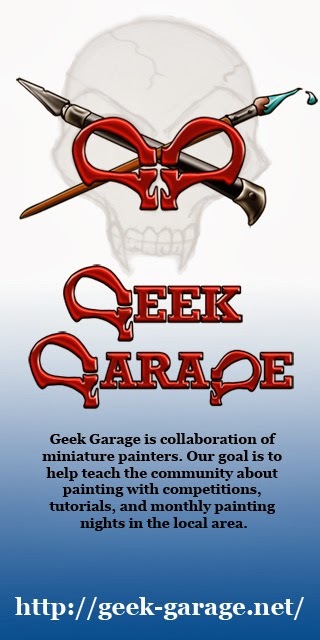 If you guys have any questions, comments, or suggestions throw me an email here, drop a comment below or pm me on the forums, otherwise have a good week and may all your dice roll tough.